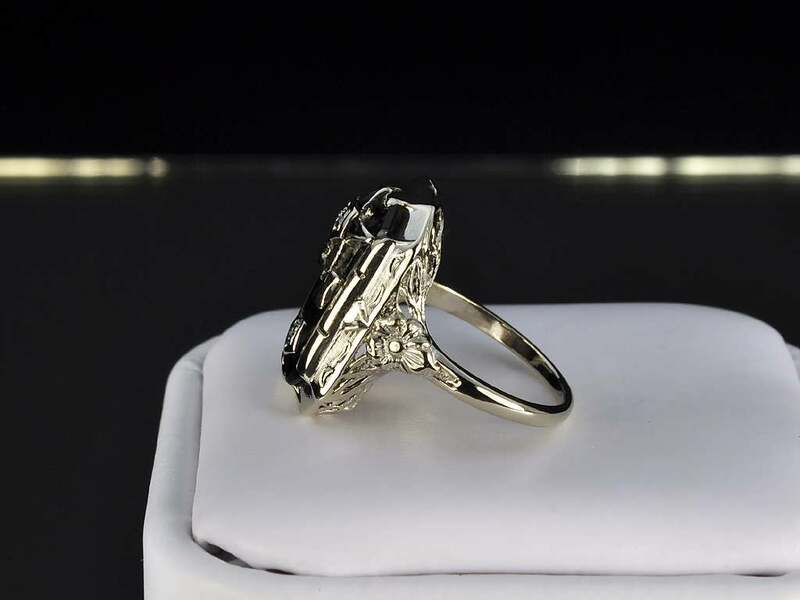 Pictures by Midwest-Jewelry are licensed under a Creative Commons Attribution 3.0 Unported License. Based on a work at stores.shop.ebay.com. Permissions beyond the scope of this license may be available at www.midwest-jewelry.com. 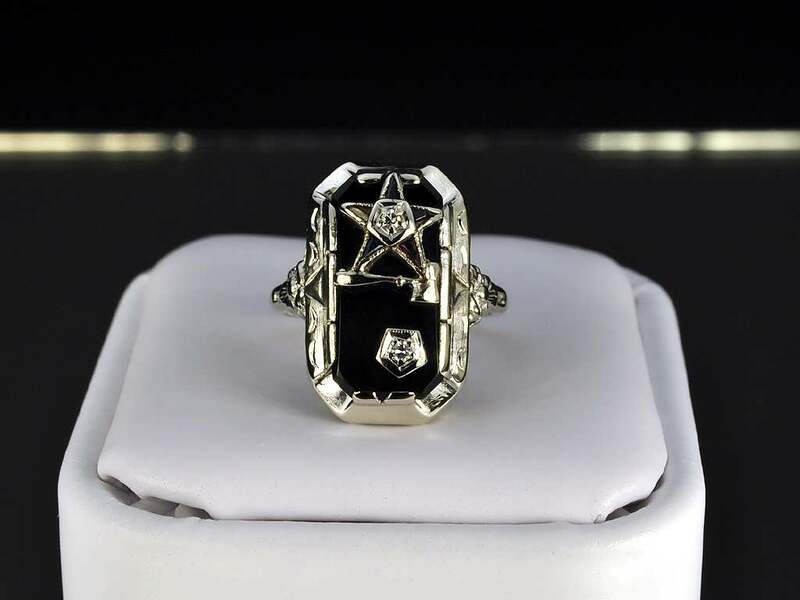 This is and beautiful vintage Eastern Star Masonic Onyx and Diamond faternity ring set into solid 10k white gold. The ring measures 13/16" wide on top of the finger, about 1/16" on the bottom and sits about 1/4" off the top of the finger. Made to please and priced to move! All rings are easily sized unless otherwise specified. We do not size rings for free. 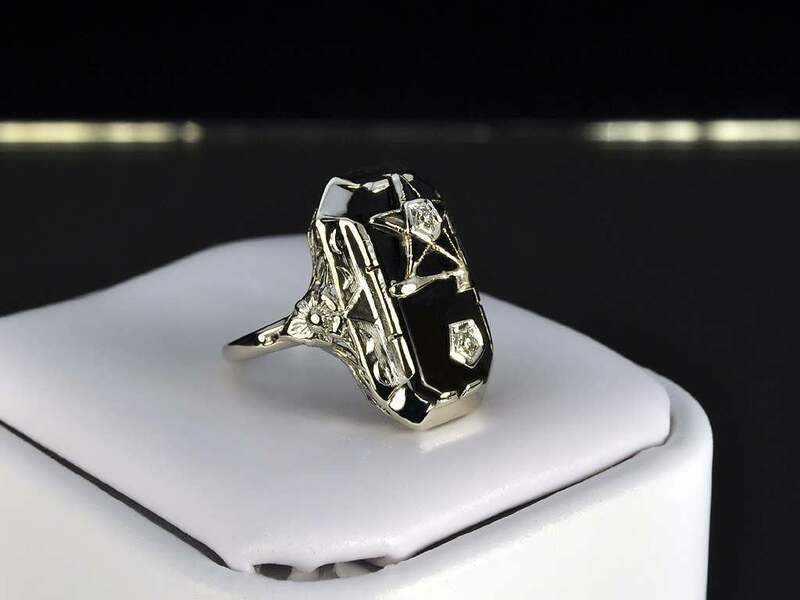 Cost for ring sizing can be provided upon request. Shipping on this item is FREE for the United States via USPS! Additional items won can be combined and shipped for FREE* in the same package! (*Combined value can not exceed $2000.00) International and APO/FPO addresses please email for quote. Midwest-Jewelry will not and can not ship anything in the U.S.A. via UPS, FedEx, or any other service that is not delivered by the United States Post Office. All international items are shipped via UPS, USPS or FedEx. Shipments take approximately 5 business days to arrive from date of shipment. All items are declared as "Merchandise." For insurance purposes we cannot declare a lesser value. We are not responsible for any customs charges or delays. Contact your local post office for duty fees. All items are shipped through the United States Postal Service. This may take several weeks depending on your location. Midwest-Jewelry accepts PAYPAL and Cashiers Check. Please email us if you have any questions about methods of payment. Payments on Auctions must be made no later than 3-DAYS from the auction close! If payment is not received, you automatically forfeit the item and may receive negative feedback. Midwest-Jewelry does NOT make 2nd chance offers on auctions not won! If you get someone offering a 2nd chance from our auctions you should report it to eBay. Items that do not make reserve get relisted. We are sorry but we no longer give out the reserves on out merchandise due to unhappy bidders at the end of the auctions. (There can only be 1 winner and if everyone throws the reserve amount in at the last minute, all but 1 will lose out and that gets people mad so they won't be given out). Please don't bid on an item that you are not sure of! Unauthorized bid retractions on an item will get you banned from all our auctions permanently. 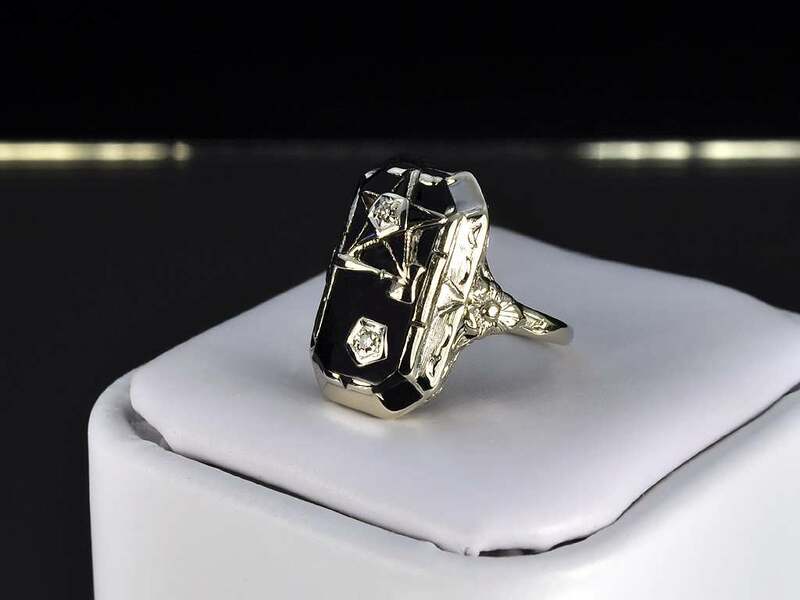 Midwest-Jewelry describes our items the best we can and by using the latest equipment to assure accuracy. If a return needs to be made, at our discretion, you will be refunded less the Shipping fees as well as a 20 % restocking fee. If you have a problem or concern before or after the auction, please let us know in a professional manner. We are not out to "stick it" to anyone on any item from $5.00 to $300,000+ and we really like happy customers so we are usually always willing to work something out to where you will be satisfied. If an auction states it has an Appraisal, then it will be included with the item. All authorized returns need to have an RMA number (return merchandise authorization) by emailing us at support@midwest-jewelry.com Items returned without an RMA # will be refused. Our Office Hours are M-F 10AM to 7PM, Sat. 10AM-5PM, Central Standard Time closed Sundays. To learn more about us, please visit our "about me" page. Items must be returned within 7 days .